I tweeted about a month ago about an “interactive storyboard” that I was working on for my city builder design. But I only made it halfway through my intended development before I got distracted with my planet generation and turn based strategy shenanigans. The result was that I never got it to the point where I was planning to blog about it. Since it is apparently delayed indefinitely, maybe I should at least show what I do have available. Having decided to declare my latest project a prototype, and further to declare that it has outlived its usefulness (see my prior post), it’s time for a prototype retrospective. My second discussion over on the Simtropolis forums focuses on traffic simulation. As a summary, I’m investigating player opinions regarding three particular questions. The first regards performance: How long would you be willing to wait for the simulation to process one in-game year? The second is about interface: What type of transit-related structures would you most like to see have a well designed interface? The third concerns game mechanics: Which transit network features would you like to have mostly for aesthetic purposes, and which are desired primarily for behavioral control? Which ones are important for both reasons? 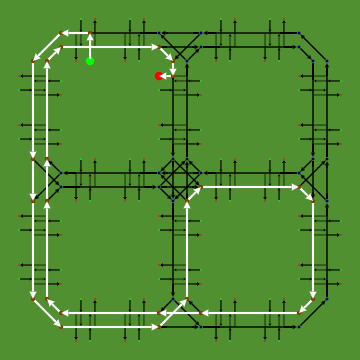 This morning I introduced myself over at the city builder game community Simtropolis.com, and have started a discussion about my city builder project. In particular, my first focus is on what a proper implementation of multiplayer might look like. If you are a member of Simtropolis, join in on my intro post and multiplayer discussion, or feel free to post any thoughts here on my blog.